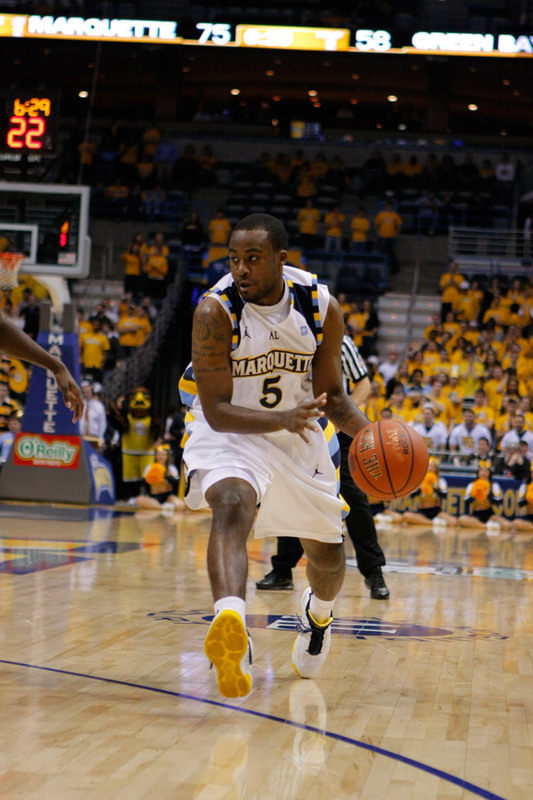 For the first time since being knocked out of the NCAA Tournament at the hands of the Florida Gators in March, Marquette players will take to the court in a public setting at the 2012 Scion Dental Milwaukee Pro-Am. Players from all over Wisconsin have been placed on eight teams and will compete in a round robin format the next three weekends before the championship tournament, Sunday, August 5 at the Al McGuire Center. Marquette will have 11 players featured in this year’s event, with Chris Otule (knee), Juan Anderson (shoulder) and Todd Mayo (suspension) sitting out. Paint Touches’ coverage will focus solely on Marquette players. For comprehensive coverage of the Pro-Am, check in with BrewCityBall.com and the tournament’s host, Jim Ganzer. Here’s a look at the Marquette pairings on this year’s roster. NCAA rules allow two returning players maximum per team, so freshman and junior college transfers are not included. For a list of the full rosters, click here. When you get down to it, all Pro-Am events are glorified pick-up games that feature little defensive effort despite pretty intense competitiveness. There’s no use putting any stock into statistics, wins or highlight reels from the event, but there are still plenty of things to watch for over the next four weekends. 1. Davante Gardner’s health: A knee injury hurt Gardner down the stretch in Big East play and in the NCAA Tournament, but he claims the knee is 100 percent. Buzz Williams said Gardner did put on some weight while resting and rehabbing his knee, so the Pro-Am’s up-and-down pace should be a good test of where is is with his knee’s health and his stamina. 2. Welcome, Trent Lockett: Marquette fans finally get to see the player who may take the reigns as a senior leader, and they’ll see him in a setting similar to the one he’ll play in Milwaukee. Arizona State was one of the slowest paced teams in the country last year and Lockett still averaged 13.0 points per game. It will be nice to see how he responds to a faster paced game and potentially more outside shooting. 3. Wilson and Lockett together: It’s a good bet that Buzz Williams had something to say about the Marquette players matched up together, and it’s no surprise that Lockett and Jamil Wilson will be teammates. Arguably Marquette’s two most important players next season, the duo’s chemistry on the court and ability to work an inside-out game together could be a preview of some real offensive firepower to come when the season begins. 4. Can Steve Taylor keep up? : Of course there was going to be a Steve Taylor mention. He’s playing with Junior Cadougan, back-to-back MVP at the Pro-Am, and Wes Matthews on the Scion Dental team. Will Taylor be able to keep up with a senior Big East point guard and an NBA shooting guard? He played with some serious talent at Simeon, but this will be another good test to see where he stands as an immediate contributor. 5. Newcomers from beyond the arc: The best chance for Steve Taylor, T.J. Taylor or Jamal Ferguson to see the court in 2012-13 is to have confidence from beyond the arc. All three scouting reports say they can hit from deep, but it will be worth tracking to see who comes out on top by the end of the Pro-Am. While it may not correlate to success next season, it’s something to watch. If there’s one thing that does occur at the Pro-Am, it’s players wanting to keep their pride when put in one-on-one situations. 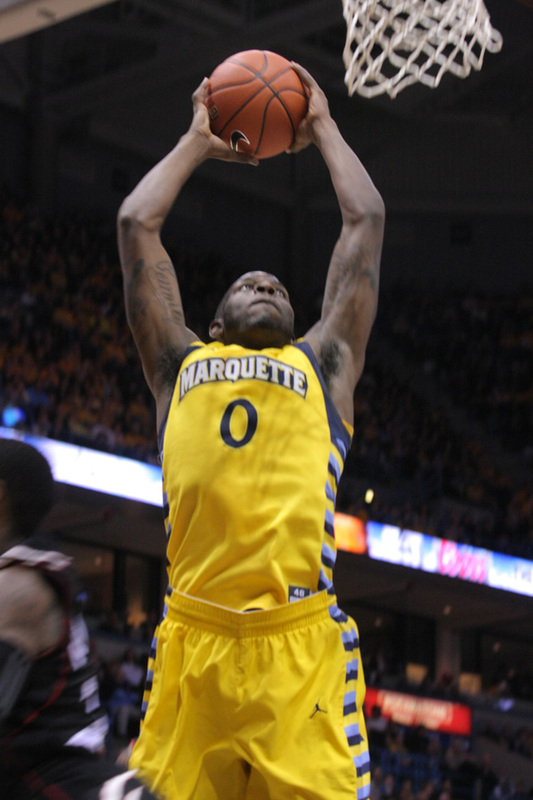 It’s a sure bet that, for the most part, Marquette players will guard Marquette players. And since that’s our primary focus over the next four weekends, here are the most intriguing match-ups you’ll see at the Pro-Am. (date and time of match-up). For a full schedule, click here. 5. Wesley Matthews vs. the field: Matthews and Jerry Smith are the only pros in the field, and everyone on the Marquette roster will want their best shot at the Trail Blazer wing. Depending on how hard Matthews goes in the games, it’s hard to see anyone taking it to him on the court. But Jamil Wilson and Lockett probably have the best chance of anyone.